UNHCR: 59.8 million people were displaced by violence around the world in 2014, one in every 122. 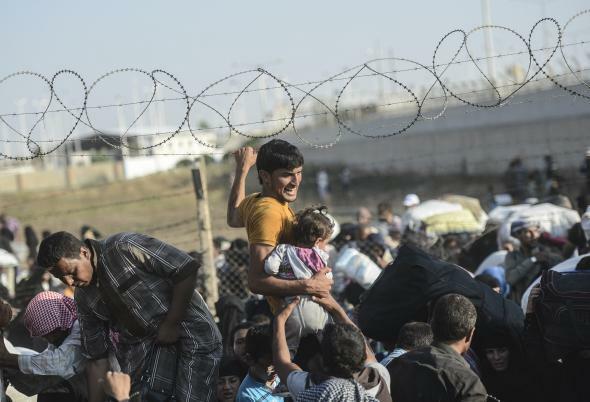 A man carries a girl as Syrians fleeing the war pass through broken down border fences to enter southeastern Turkey on June 14, 2015. The staggering numbers are caused by conflicts in a relatively small number of countries. Just three countries—Syria, Afghanistan, and Somalia—account for 53 percent of those displaced. The top 10—also including Sudan, South Sudan, the Democratic Republic of Congo, Myanmar, the Central African Republic, Iraq, and Eritrea—account for 77 percent. While the intractable conflicts in Afghanistan and Somalia, as well as more recent outbreaks of ethnic violence in Myanmar and the Central African Republic, shouldn’t be overlooked, Syria is the main driver of the problem. With more than 3.9 million refugees living in 107 countries, Syria overtook Afghanistan as the world’s largest source of refugees last year, a spot Afghanistan had held since the early 1980s. Including the 7.6 million displaced internally, about half of Syrians have now been uprooted. The unprecedented scale of the global refugee crisis has sparked political controversy in developed countries, with Europe reluctantly working to address the influx from the Middle East and South Africa, the United States seeing large numbers of children fleeing violence in Central America, and Australia fending off international criticism for turning back migrants from South Asia, many of them Rohingya fleeing ethnic persecution in Myanmar. But the burden for hosting refugees is still being overwhelmingly shouldered by developing countries in the Middle East and Africa, often straining their humanitarian budgets to the breaking point. Five countries—Turkey, Pakistan, Lebanon, Iran, and Ethiopia—host 30 percent of the refugee population. Lebanon, a country of about 4.5 million people, is hosting more than 1 million refugees thanks to the conflicts in neighboring Iraq and Syria. Nevertheless, the staggering number of refugees from conflicts in just a small number of countries, a crisis that is straining the world’s humanitarian resources to the breaking point, is a reminder that even if this violence is localized, it’s fast becoming everyone’s problem.